THIS ARE THE OLD UPDATES THAT ARE NOT AVAILABLE ONLINE ANYMORE!!!! Laura and Martin, she in pink cotton pants and a denim shirt over top, he in dark jeans and a white shirt on Nikes. Judith and Danny posing and loving while being wet! Good movie of Marjolein and Gert in their elegant outfits, dancing, playing and getting soaked! Elvin and Danielle are wearing elegant clothes, she in a little black dress with pumps, he in black pants under a purple blouse. Nicky & Tim in great outfits are very romantic and beautiful people. 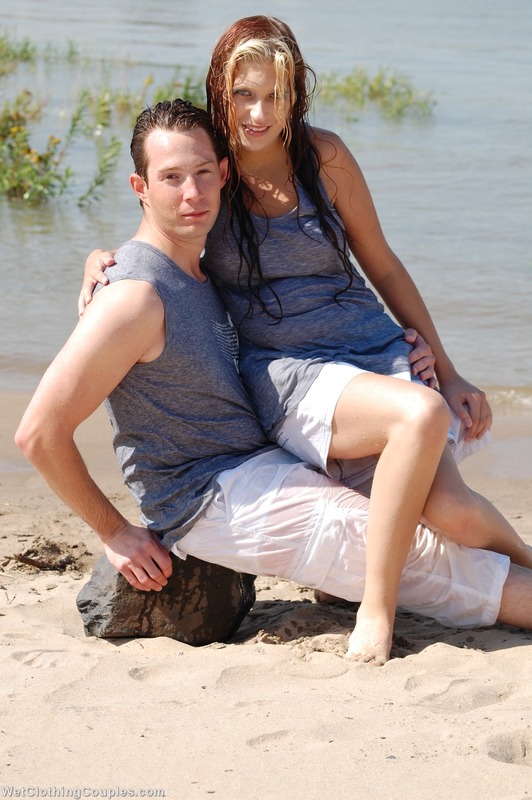 Jolanda and Robin get very romantic from the beach, the sun and the wet feeling in their soaked clothes! Joyce and Thijmen in black clothes under beige jackets play and jump around getting fully soaked! Video of lovely couple Suzanne & Jurriaan in their office wear. Her red hair stains on her cr�me jacket, but she doesn't mind, she has big fun getting wet with her love! Laura and Martin in a blue set with jeans and lots of love! Danielle & Elvin love each other, but love a good fight as well! They have some full contact kickboxing in the water, getting soaked in the proces. Movie of Marjolein and Gert, they get out of their cowboy gear and experience the feeling a hot day and warm water gives you. Very romantic, lots of loving and beautiful people. Joyce and Thijmen are in a very romantic and playful mood. She in a jacket over red top and a skirt over black leggings, he in black pants and pink shirt. Judith & Danny enjoy the sunshine and play with a bucket and each other. wEG Judith loves Danny, Danny loves Judith, and together with water that makes a very nice set! A mature couple living nearby was watching us shoot and wanted to join! Within minutes after we met them, they jumped into the water and had big fun! He is wearing dark denim and a white shirt, she is wearing white pants, a shiny top and stiletto heeled leather boots! Movie of new couple Nicky and Tim in very nice clothes! He is wearing a beige pants with denim shirt over white T-shirt. She wears tight black pants under a white blouse. Laura and Martin came back to have a playful shoot outdoors. They laughed and enjoyed it a lot! Danielle & Elvin are wearing jeans and a T-shirt, being very casual and very romantic in a lake. Jolanda & Robin get a bit frisky while being wet, they do love each other very much and it shows! Lovely new couple Suzanne & Jurriaan in their office wear. Judith and Danny in very good outfits on a hot summers day! Both wearing black pants with a great shine when soaked. 2 movieclips of couples playing in a river, not that long but very nice clothes! Also with pics. Laura and Martin taking a shower together, she is washing him with shampoo. Jolanda and Robin are a young couple we know for several years now. They are still very much in love, and wanted to express that in wetlook! Movie of Krista and Johan, relaxing on the beach in plain shirts. They use a bucket to drench each other and love to get wet and be romantic. Movie of Sarana and Bas, walking around in a lake, splashing each other, kissing and just getting all soaked! Stephanie and Ricky in a playful mood at the beach. Both wearing designer jeans and shirts, they pose, play and frolic! Good movie of Daphne and Gazz, both in white shirts, taking a very romantic shower. Young couple Laura and Martin in the shower, both in jeans. They shower each other with care and love. Beautiful couple in jeans plays on the beach, trying to throw each other in the water. They struggle and laugh, and at the end they both get soaked! Movie of young couple Jolanda & Robin. He is always cool in jeans, she is wearing a short denim skirt which comes off halfway. Movie of Joyce and Thijmen, this was their very first wetlook-experience. Good movie of Sarana and Bas, she is wearing a good leather jacket and both have nice, expensive clothes on. They play, fight and laugh a lot while getting completely soaked! Special set of Tess and Oscar, in which he is ripping her wet jeans into shreds :-) Movie and pics. A fantastic movie this week of schoolgirl Rebecca secretly smoking. They cuddle and make-up, kissing and enjoying the water. He is wearing gray pants, black shirt and black shoes. She wears a white legging under a plaid skirt and a thin white blouse. Young couple Sarana and Bas are very much in love and being wet together is a great way to enjoy that! and she a grey tanktop under a white hoodie. Nice playing in the water. New couple Laura and Martin are very enthusiastic about getting wet together. They wet each other slowly and are both having fun and being tender. Movie of Tess & Oscar, both in jeans outfits, running around on the beach and splashing each other all wet. The movie ends a bit X-rated, but the wetlook is very nice to see, they really enjoy it! Wendy & Arjan both in pink, she wears a jeans skirt and pink top, he a white pants and a sheer pink blouse. playing, kissing, lifting each other and just being very happy to be in the water! he in a black pants with white shirt, she on heels, pantyhose and a black blouse on a black tube skirt. He throws buckets of water over her, and she uses her hands to make him wet. Movie of Rakhee and Michael, a loving couple that cuddles, fight and make up in the water. Her dress is a bit short and has some pantypeeks, but his regular jeans make up for that in a great way! Both dressed in nice black outfits with formal look to it, Karina tries to get her boyfriend Jade wet. But he is too strong, so she has to wrestle him to get him soaked. They really enjoyed playing in their wet clothes, nice movie! Very playful young couple Kelly and Tom are on the beach and try to throw water at each other. Tom is much stronger and throws Kelly in the water, wearing all her clothes (white leather boots, a tight denim jeans and a little gray tanktop). They feel romantic and have fun playing in the water. Gwen takes Melanie into the water. He was there for a photo shoot, but she was just watching, and brought no dry clothes at all. But the sun was so warm, the mood so good.... she decided to do some poses, but ended up all soaked. Luckily the sun dried her clothes. Young Dutch Couple Marijn and Nick taking a shower together, fully clothed wetlook! She gently washes his hair, and he is rinsing her hair as well. Jeans, sneakers, shirt on him and a tight black dress on her make this a romantic scene, you can feel the love between them! Jessica and Yves are wearing all their regular clothes, but jump right into a great mudpit to play, kiss and have big fun! At the end they wash themselves in a river. Tess and Oscar are a couple that gets turned on by wet clothes, so we had just the right shoot for them! It begins rather lovely and romantic, with lots of kissing and touching, but the more they get wet, the more they get hot! Young asian couple making love in the water. All nice and descent ofcourse, as they are wearing all their clothes. They do get completely soaked, which makes it even more fun! Nick is wearing blue pants and a plain whit T-shirt. He loves to get completely soaked under water. Tall guy and his tiny girlfriend with big curls are in a romantic mood when they are at a river. Rebecca gets dressed up by Maurizio. He is very gentle with her, taking care she buttons all her clothes. But then, he takes her for a swim, and dips her in the water with her clothes on! :-) Romantic and funny. Movie of young couple Krista and Johan in a playful set. They first throw water at each other to get the other one soaked. After that, they use buckets full of water to pore over themselves and get even more wet. Funny part is where they both empty the bucket on their heads, but Johan kept his cap on, laughing at Krista who got completely soaked.